My family spent the Dragon Boat festival in Zhu Shan. 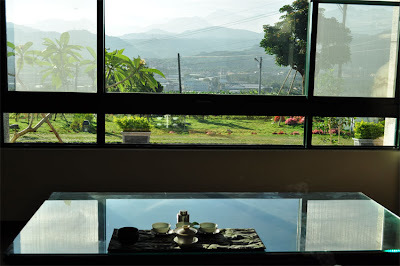 We stayed in a new hotel surrounded by tea fields! It is located on the western side of town and it's facing the mountains of Shan Lin Shi. The sunrise is magnificent. 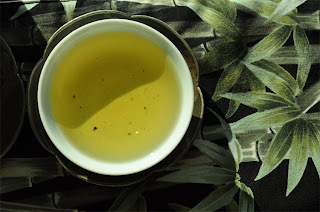 Lately, I have taken the habit of drinking a Hung Shui Oolong very early in the mornings. It's a time when my children are still sleeping (and everything feels peaceful). 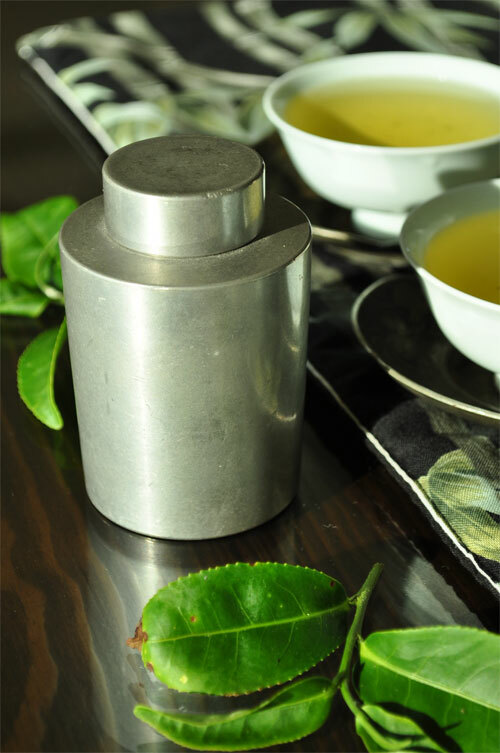 Tea brings its burst of warm and balanced energy. In Zhu Shan, facing Shan Lin Shi, it was the perfect time and place to brew my High Mountain Hung Shui Oolong from Shan Lin Shi, harvested on April 20, 2010. (The 2011 version still needs some rest). I brought a simple tea set with me: a Cha Bu with bamboos (because we're in Zhu Shan, bamboo mountain! 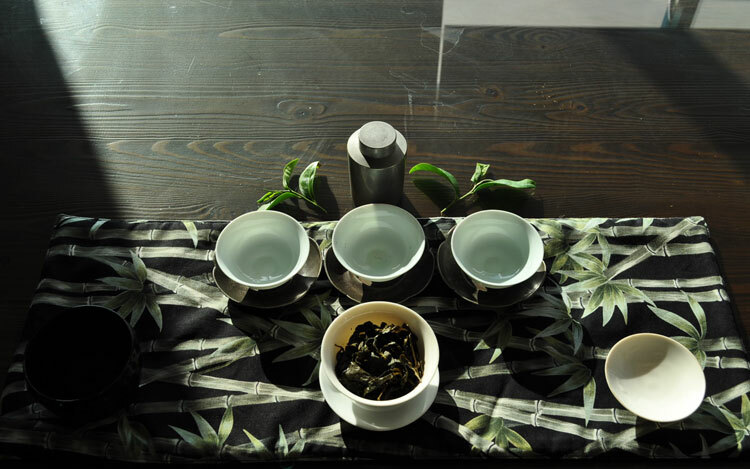 ), a ivory porcelain gaiwan, 3 singing cups, 3 old pewter Cha Tuo (saucers), 1 small pewter tea caddy and a small black bowl by Ginkgo for the waste water. Boiling water is almost never a problem in Taiwan, so used the water and accessories provided by the hotel. 2. sweeten and refine the taste: the Shan Lin Shi terroir has a lot of finesse and this roast has nicely underlined this characteristic. 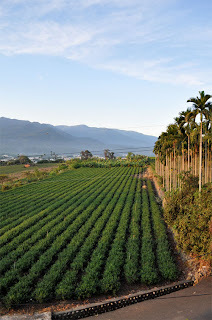 At the same time, the core freshness is preserved: the energy of a young tea is there, but in a very balanced way. The day has started with so much beauty and warm energy... 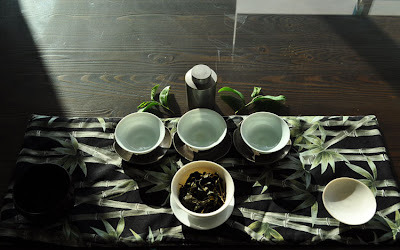 I'm so glad that I could take these pictures to share this moment of tea happiness with all of you! 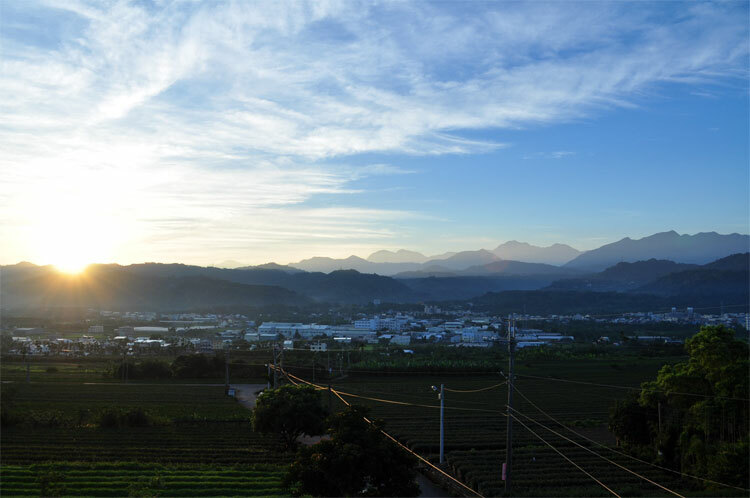 I'll help you book a room there when you come back to Taiwan! 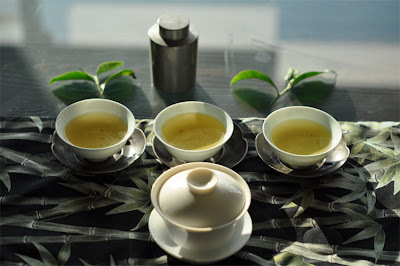 Gaiwan ivoire, coupes qingbai. Accords un peu désaccordés, mais harmonisés par la lumière. Je suis d'accord!